An Interstellar Start in LED! 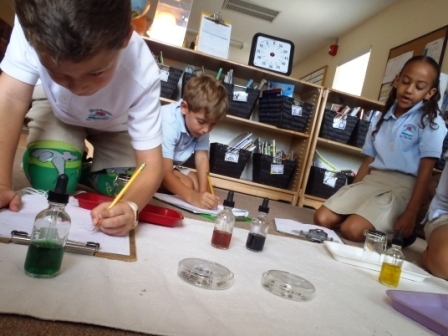 The Lower Elementary years offer fertile ground for inspiration and wonder, and it is during these impressionable, imaginative years that Montessori’s Great Lessons are indelibly presented for the first time. This vast and comprehensive series of five stories, which spans the creation of the universe, the coming of life, the development of early humans, and the invention of writing and numbers, is meant to ignite the fire of the child’s curiosity and imagination. 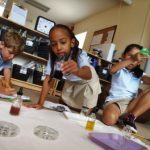 Along with coordinating key lessons, they create the fundamental backbone for the Montessori curriculum, and an expansive framework for deeper study and exploration. 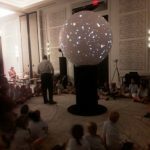 Throughout the first few weeks of school, the children in the Lower Elementary Downstairs (LED) class have focused on concepts from the first Great Lesson, the Story of the Universe. 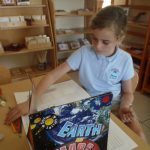 This comprehensive story touched upon key concepts in the physical sciences, including the rules of attraction, the states of matter, concepts of density and temperature, the formation of the Earth, plate tectonic theory, and volcanic eruptions. 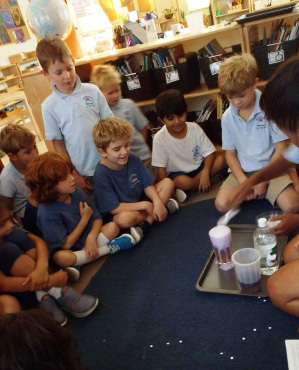 Science experiments offered ideal follow-up studies, and first-year students modelled the movement and attraction of the three states of matter with metal bearings, and observed the rapid, explosive nature of the “big bang” theory through an experiment involving milk, food dye and liquid soap. 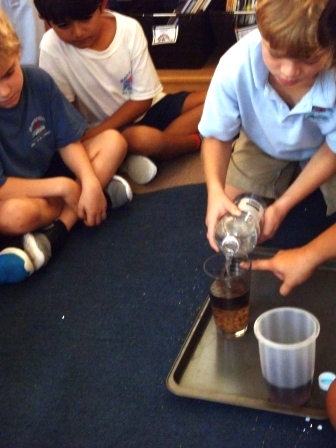 Older students explored the weight and settling of particles by carrying out experiments on density, and re-familiarized themselves with fundamental skills in making hypotheses and recording observations in the process. 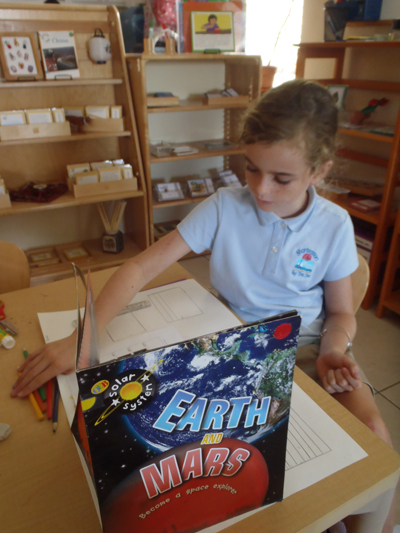 They also created clay models of the layers of the Earth, and third-year students further explored plate tectonic theory through interactive guessing games and an experiment with graham crackers. 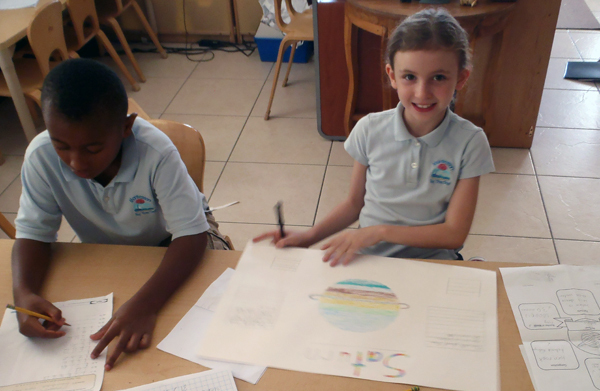 All of the children have also begun independent space projects. 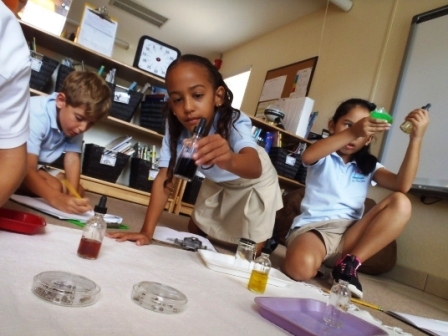 These first forays into report research and writing are essential in getting the children excited about reading and writing, and offer many opportunities to meaningfully integrate lessons in organizing information and basic sentence and writing structure. 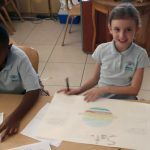 Younger students are enjoying collating pages of carefully-written facts into their very own planet booklets, and older children have been practising gathering information using graphic organizers, and creating either detailed books or artful posters. 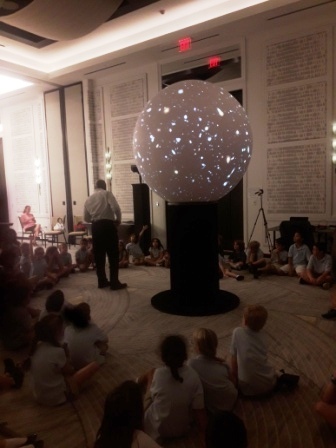 In the month of September, we were also very fortunate to attend a complementary presentation of NASA’s ‘Science On a Sphere’ at the Kimpton Seafire Resort. 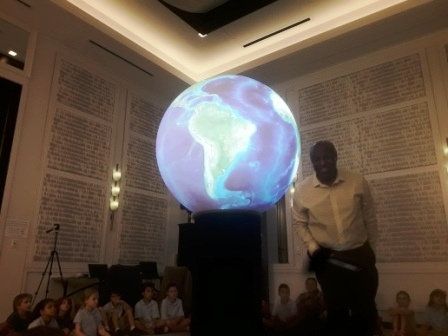 The children were astonished by a giant, animated model of the Earth, and marvelled as our knowledgeable and engaging guide, Mr. Maurice, discussed very relevant topics such as the heating and cooling of planets, the vastness of galaxies and the universe, and the importance of caring for our precious planet. 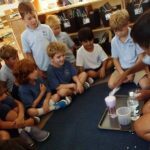 It was a great way to give the Great Lesson further dimension and impact. 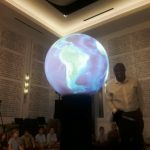 Unlocking the secrets of space and the Earth has been a stellar way to start in September, and we are all excited for the infinite universe of discovery that beckons in the year ahead! 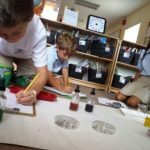 For almost 20 years, Montessori By The Sea has been providing excellent, inspired and child-centered Montessori education to the Cayman Islands. 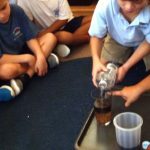 Montessori By The Sea is the only school in the Cayman Islands to offer a comprehensive, internationally-recognized Montessori program for children ages 21 months to 12 years old (Toddler to Grade 6).